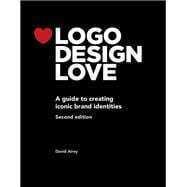 Completely updated and expanded, the second edition of David Airey’s Logo Design Love contains more of just about everything that made the first edition so great: more case studies, more sketches, more logos, more tips for working with clients, more insider stories, and more practical information for getting the job and getting it done right. In Logo Design Love, David shows you how to develop an iconic brand identity from start to finish, using client case studies from renowned designers. In the process, he reveals how designers create effective briefs, generate ideas, charge for their work, and collaborate with clients. David not only shares his personal experiences working on identity projects–including sketches and final results of his own successful designs–he also uses the work of many well-known designers such as Paula Scher, who designed the logos for Citi and Microsoft Windows, and Lindon Leader, creator of the current FedEx identity, as well as work from leading design studios, including Moving Brands, Pentagram, MetaDesign, Sagmeister & Walsh, and many more. A self-employed graphic designer from Northern Ireland, David Airey writes three of the most popular graphic design blogs on the Internet: DavidAirey.com, LogoDesignLove.com, and IdentityDesigned.com. David’s blogs have attracted hundreds of thousands of loyal fans who read and are inspired by his writing every day. Airey is also the author of Work for Money, Design for Love.